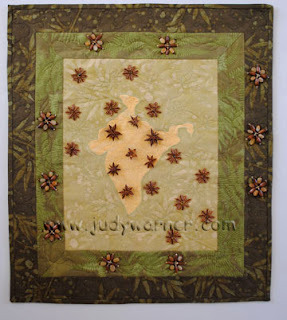 A number of people have commented on the watermark that I have been able to add to the photos of my quilts. The process actually is not that difficult. Lisa Chipetine found a link for me that explained how to create a watermark in Photoshop simply enough that even I was able to follow it. I don't claim in any way to be very proficient at using Photoshop. The instructions are provided by Show and Tell - Graphics. They include illustrations of the various tool windows in Photoshop that you need to manipulate. That really helps a lot. You are able to make your own custom designed watermark. There are other tutorials available on the web. I found one for Photoshop Elements that I didn't think was illustrated as well. It was created by Bright Hub. If you would like a video, Republic of Code offers a 4 minute instructional video. It is basically the same process as Show and Tell-Praphics as it is for Photoshop. However, Republic of Code illustrates two different styles of watermarks. The instructions are how to create the watermark in a photo. I prefered the Show and Tell-Graphics approach which allowed me to create a watermark file that I could open and transfer to any of my photos, rather than creating the watermark from scratch in each photo. That isn't covered in the Republic of Code instructions.